Aparna Nancherla’s comedy can be described as a classic. Her nasally, bird-like observations of a single woman simultaneously dealing with depression and joking about it is a mold we’ve seen before. She could be described as a classic. But I prefer to think of her as something new: the product of expectation and the internet. Some of her jokes read like Tumblr text posts written by girls tapped into the Western world’s constant ennui. She’s part comedy, party Nietzschean reflection. Sad girl and shitposter. Her first comedy album, Just Putting It Out There, is a collection of appropriately modern jokes. She riffs on New York, going to therapy, her dating life, and fruit. Just Putting It Out There is delightful. It promises and delivers. It will you keep you giggling if not laughing out loud. It’s a constant joke trickle and completely inoffensive, perfect for a commute. Comedy albums are on their way back in. Certain comedians, like Hari Kondabolu, are striking out on the internet and developing core global audiences. Downloadable albums, like podcasts, are reaching this ready and waiting market. 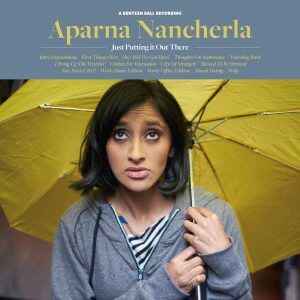 Aparna Nancherla is giving audiences what they want — a blend of memes and relatable observations that address mental health and New York City life, like a worthy update on Woody Allen. She’s a comedian to watch. Just Putting It Out There is available on iTunes.